It’s my pleasure to be representing 183 Fairlawn Drive. 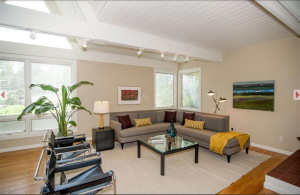 This Chalet-style home with its clean lines and inviting interior offers a peaceful retreat in the hills. And yet you are close to all of the wonderful amenities of Berkeley: its great neighborhoods, Lawrence Hall of Science, LBL, the UC Campus and Tilden Park. A bus stop is a block away. Visitors are surprised to learn that it takes 12 minutes by bus to arrive at downtown Berkeley, or a 10 minute drive to get to my office at the top of Solano Avenue. This home embodies the highly-desirable mid-century aesthetic. High wood-paneled ceilings with multiple skylights, and large triangular windows provide abundant natural light and sylvan views. The main upstairs living area is open and welcoming with a wood-burning stove and expansive dual-pane windows. Walls and ceilings have been freshly painted, the oak floors refinished, and the kitchen and main bathroom have just been updated. A small deck off the kitchen was also just rebuilt, and provides a pleasant spot to enjoy your morning coffee alfresco. At the street level you will enjoy a spacious room that would make a third bedroom, great office, or could serve as the family/media room, or comfortable guest quarters with an adjoining half-bath and laundry facilities. The front garden is planted with drought-tolerant plants and natives. And just down the block is the recently updated Terrace View Park, with basketball court, picnic area, swings and multiple play areas. It’s a great place to spend time outdoors and also enjoy your own neighborhood! Next post: The East Bay Autumn Market: Does it become more vibrant like the leaves, or cool with the weather?